A little over a year ago I told you that if you want something to be different about podfeet.com or the podcast, you should go ahead and ask. I think this bears repeating, maybe once a year. It has come up just lately because a few people have made requests and I thought if I told you about their suggestions it might give you courage to ask. I want to emphasize that I will absolutely entertain all suggestions but I definitely don’t implement every request. Some I just don’t want to do, and some are too hard to do. But why not ask? Worst thing I can do is say no, right? Lewis Butler wrote me a very polite note asking whether it would be possible to make the text titles under the podcast logos on the Podfeet.com home page into links to the podcast posts. In other words, he likes text. It took a bit of jiggery-pokery with the layout builder text widget I use from Site Origin (my theme maker) but I figured it out. Their text widget doesn’t allow the title to be a link, but I found a workaround in the forums where they suggested using a heading tag and making that a link and putting it all into the body of the text widget. Site Origin does have a generic HTML widget, but oddly that widget also precludes making the title into a link!. Anyway, You’ll now notice that all of the titles under the podcast logos are now also links to the episodes, just the way Lewis wanted. See? All he did was ask (politely) and his wish was granted. A couple months back, Kevin M asked for something and I couldn’t see at first how to easily do what he wanted. He said that he likes to sort his podcast episodes by how long they are as a way of choosing which podcast he’ll listen to next. He noted that while other shows (like Bart’s Let’s Talk Podcasts) give him the length, mine do not. I wasn’t so easy on Kevin because in 12 years of podcasting no one else had ever asked for the time length to be embedded in the feed, and it seemed like it would be really tedious. I create the podcast feed which is actually a very simple text file, using a tool called Feeder from Reinvented Software. I thought perhaps the developer, Steve Harris, had a way within Feeder where this could be automatically inserted. Feeder figures out the bit length of my audio files, it seems it should be able to figure out the time length as well. Steve got back to me and explained that if I didn’t insist on using a third-party client to securely FTP my files to a server, and instead allowed Feeder to do it, it would auto-fill the time stamp into the feed. I invented my current process so long ago that I don’t always take advantage of these new-fangled features. I thought this was a swell time to do an experiment and see if I could trust Feeder with this critical task. Testing this new process was unfortunately problematic. The audio files you receive are stored on a service called Libsyn, and they have a very weird way of dealing with the files. You first upload them using SFTP to a very normal-looking directory. I send them to ftp-server.libsyn.com and a remote path of nosillacast/public. That’s all well and good, Feeder can easily do that. The problem is that within very few seconds, the Libsyn server grabs that file and whisks it away to a completely different location. The download directory is completely different from the upload directory. Downloads come from traffic.libsyn.com/nosillacast. So even if I did use Feeder to successfully SFTP the file up, the location would be wrong in the feed so I’d have to change it. This completely erases the value of using Feeder to determine the time length. I talked to Bart about how he does it, and he said he types the time in by hand. I really wanted an automated way but I couldn’t see how to accomplish it. When I paste the URL from Libsyn into Feeder for the audio file, I then hit a button that queries the file for the bit length from the server. When I do that, I ALWAYS compare the bit length it finds to the bit length of the same file in the Finder. This is a check on myself to make sure I have the right file name in Feeder. 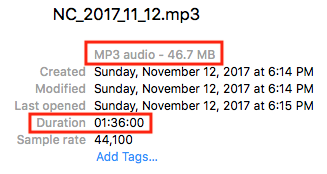 It occurred to me that when I’m looking at the file in the Finder to verify the bit length, the podcast duration is right there in the same Finder window. So how hard is it for me to just type that number into Feeder? Not that hard. For the past few weeks, I’ve been trying really hard to remember to type in the time, just for Kevin M.
Let me add one more thing. I didn’t jump at the opportunity to help Kevin with this. There was a lot of whining on my end and me telling him all the reasons why it either couldn’t be done or was too hard. But he wore me down. I sure hope someone else actually likes this too! In the same vein as Lewis’s request for text to be links, George from Tulsa and Nick (I confess I forget which Nick) both want me to do something to make the Live logo different in some way to catch their attention better. They look at that row of icons and they just can’t see the Live show image as being any different than the regular NosillaCast logo. It does say “Live” in pretty big letters but it’s just not working for them. I haven’t done anything about this one yet. I’m kind of paralyzed because I like the logo the way it looks now and I can’t think of a way to keep it in the style of the regular NosillaCast logo and yet stand out better. Maybe in a passive-aggressive way, I’ll just make the font on the word Live just a little bit thicker and declare success? But they asked so nicely… Maybe I could put text below the logo that says Live! In it, and make it a link like I did for Lewis. That way they could search for the word Live! Or, I could be stubborn and tell them to just memorize podfeet.com/live – I do say it every single week at the end of the show, right? I decided to tell you all of the ideas people have sent me in descending order of how open I was to their suggestions. This week Joe LaGreca posted a screenshot in our Facebook group of the Mac Power Users podcast showing an index of timestamps for each subject in the episode. He talked about how wonderful it is and made it a feature request for my “WONDERFUL” Podcast. He even capitalized WONDERFUL. That darn Dave Hamilton of the Mac Geek Gab jumped into the conversation and explained that he does it so people can go back to reference things they’d heard. Joe agreed with Dave that it’s exactly why he wants it. I would like to point out that Dave Hamilton owns a company. With staff. Paid staff. He does this himself though, so maybe that’s not a great excuse. The last time I checked, mp3s could not contain chapter markers, which would mean I’d have to create m4a files for the chapters to exist, and that meant maintaining two separate feeds and uploading two audio files, doubling the cost of storage. Not gonna happen! Unfortunately, I thought to ping Dave Hamilton while writing this up and he explained that mp3s can contain chapters, and pretty much all non-Apple podcatchers can read the chapters. I thought maybe I could use the excuse that I want people using iTunes or the Apple Podcast app to be able to listen too, but sadly he explained that the Apple apps just ignore the chapters and work just fine. Darn it. 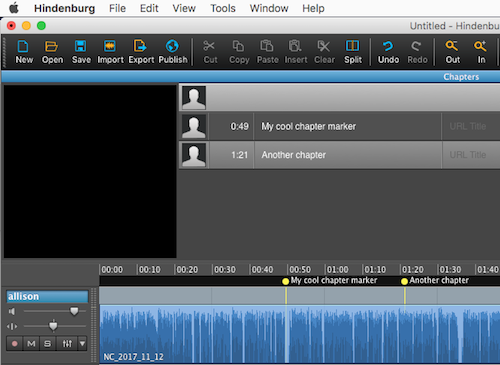 I checked out my recording software, Hindenburg Journalist, and realized that it has a really easy keystroke to add chapter markers. And if you’ve ever been to the live show, you’ll know that I stop and start at each new blog post, so I could easily drop in the chapter markers when I stopped for each post. Dagnabbit, I’m running out of excuses here. I’m going to try creating the chapters in this show, but no promises. I con’t know whether my audio loudness and leveling application Auphonic Leveler actually preserves the chapters when it converts my file from aiff to mp3 for you. According to the documentation, the desktop application (for which I paid dearly) doesn’t support “chapter management” but I’m not sure if that means they’ll be destroyed. I could switch to the paid-for web service but that would be above and beyond what I’d be willing to fund. I suppose we could do a Patreon funding goal for that if it comes to that. I can’t really test this without having a podcatcher catch the file, so I guess we’ll all find out at the same time when we download the feed tonight. Anyway, like I said in my previous post and the introduction if you want something, ask! I’m either going to say yes, or I’ll say no and tell you why it’s too hard and still let you argue with me. I’ve had a lot of fun trying to find reasons not to do what you ask when I think it’s too hard, and I’ve learned a lot along the way so I love it when you ask me for enhancements to the show and the website.